Holy hot chicken! 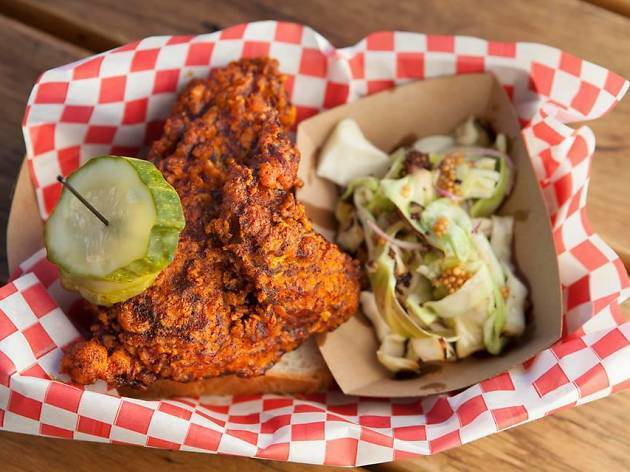 The chef behind Howlin' Ray's, Johnny Zone, has spent time in the kitchen with some of the best chefs in the world, but he's really found his calling by bringing Nashville hot chicken to Los Angeles. Head to their first brick and mortar in Chinatown's Far East Plaza for a plate of chicken (white or dark) with whatever level of heat you can handle, from "Country Fried" to "Howlin' Hot." You're supposed to be sweating. You're supposed to get messy. You're supposed to be eating some of the best fried chicken in town. I waited in line for 140 minutes to get my fried chicken sandwich, and it was 100% worth it. If I have one recommendation, it's get the Sando. The chicken alone is delicious, but the sandwich has the perfect balance of slaw, sauce, and pickles, and the bun is a perfect match for the chicken. I don't have the biggest spice tolerance, so I got mild and it was just perfect. I also got a medium spice wing and it was a little too much to handle on it's own, but would have been great in a sandwich. Pro tip: grab a seat inside - they bring everything to your table, keep the pickles coming, and might even give you free fries! The lines for Howlin' Rays blow my mind. Sometimes the lines block the other businesses, they are so long. One day I went for lunch with a group to try a sampler of their dishes. Overall, the chicken was very crispy and juicy inside. Although I have a high tolerance for spices, something about the dry, powdered chili was a bit harsh on the throat. I still enjoyed it a lot, but realized I have to go 1 rung down from the usual spice level. I tried HOT and it burned so good! Long lines, but worth every minute. This is the best fried chicken place in LA! The meat is so juicy and the seasoning packs a punch. Be sure to try a few different heat levels, but be careful! Hands down, one of the best chicken sandwiches in town! There's a reason why they call it "Howlin' Rays" though. It's one spicy bird. You could get the mild and still feel the burn. It was only a matter of time before Howlin' Ray's opened up their own brick and mortar. I fell in love with their truck after one bite of Nashville hot chicken, and can't wait to have a sit down place to go to and make a mess. Everything works here: the flavors, the texture, the combinations of chicken to choose from, the friendly and welcoming demeanor of the people behind Howlin' Ray's. They're killing it, and deserve every bit of their success. Howlin' Rays is an absolute game changer. 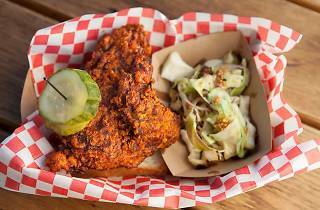 Their Nashville hot chicken so addictive and crave-worthy you may find yourself wanting to eat it for every meal. Their chicken sandwich is out of this world and it would be a real shame not to go ahead and order a side of fries covered in "hot shake". Chef Ray puts so much love and attention into his cooking to create some of the best food in town. I can't wait for their brick and mortar location to open up in Chinatown! If you come across the Howlin' Rays truck, pop-up or whatever other form it make take, you absolutely have to order a sandwich. Their fried chicken sandwich is simply one of the best in the city. The hot heat levels are no joke, but I found mild or medium to have enough of a kick with plenty of flavor.